May 17, 2018 11:42 am. Queensland trainer Ben Currie has his sights on yet another stakes victory. 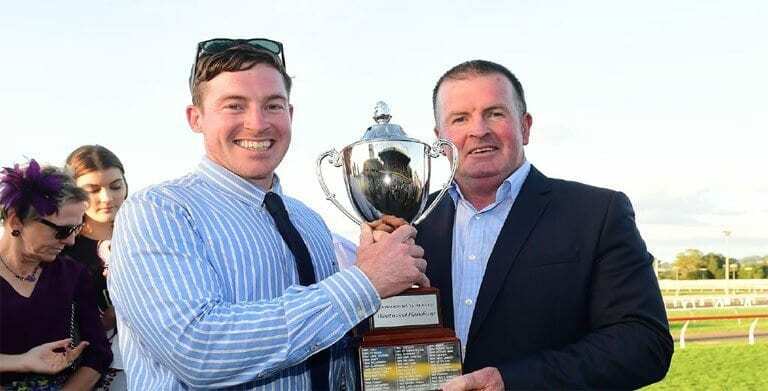 Toowoomba trainer Ben Currie has recorded his 500th career winner and hopes to bring up his 12th stakes victory in the BRC Sprint at Doomben. Currie has put aside turmoil from an ongoing stewards investigation into activities at his stables five weeks ago to continue training winners. He leads the Queensland trainers’ premiership with 127 winners this season and is fourth on the metropolitan list with 41. Currie has two runners Cantbuybetter and Ruettiger in Saturday’s Group Three BRC Sprint (1350m). Two of his 11 Stakes winners to date have been in Group Three class with Rothera in the 2010 Moonga Stakes at Caulfield and Col ‘N’ Lil in last year’s Lord Mayors Cup. “I don’t really keep records but it was s thrill when people started telling me I had reached 500 winners this week,” Currie said. “It is a tough race on Saturday but Cantbuybetter has a good first-up record and I have always liked him as a horse. We might even be able to get him out to a middle distance this campaign,” Currie said.